In May of year 6, your child will sit a reading test as part of their end of Key Stage Two National Curriculum Assessments (SATs)*. This is designed to assess how well your child is doing in relation to the National Curriculum programme of study for reading, and is primarily a test of reading comprehension. Children are given a series of texts to read and written questions to answer about what they have read. Many of the skills they need are also transferable and useful for the reading they will need to do at KS3. Encourage them to read regularly. This should include a range of fiction as well as non-fiction texts, such as leaflets, newspapers and information books. Suggest that they try a different author or genre every couple of weeks to broaden their reading experience. Reading stamina is needed for the test, so encourage them to tackle longer passages and also check how long it takes them to read different texts carefully. Practice booklets with example questions can be helpful to prepare your child for giving written answers and to help them with timing issues. Skim a text, such as a magazine article, to get a quick sense of what it is about. Talk about when this skill might be useful. Remind them that close reading is needed to understand a text fully. Ask them to ‘scan’ a text to find some key information. For example, glance through a synopsis of a film you are about to watch and find out the main characters’ names. Point out how we can easily find things like names and dates, due to the use of capital letters or numbers for dates. Pick out five key facts from a non-fiction book they have read. Summarise the chapter they have read in three sentences. Sum up the main character in three words. What evidence do they have for this? Draw a timeline for the story. What did they learn about the main character’s feelings in the part of the book they have just read? What clues helped them work this out? Ask them to choose one key point in the story and write a thought bubble for one or more of the characters involved. Can they predict what might happen next? Have there been any ‘clues’? Remind them that their prediction should be based on evidence. Suggest that they reread the opening paragraph. Are there any clues about the time or place the story is set? Was there anything special about the away the text was laid out? Did it make the information more appealing or easy to read? Look at one of the illustrations. Are there any captions or labels? If not, could they add some? Are there any words they do not know? Could they work them out from the context? How could they check? Keep a list of interesting new words. Find a word that really stands out. Why is it a good word to use? Can they suggest any alternatives? Find an effective description which helps convey a picture or idea. Draw what they imagine based on the words used. Were there any technical or special words used by the author? Can they explain what they mean? Did any characters change as the story progressed? What were they like to begin with? How had they changed by the end? Did their views about a character change as they read the book? Why? When reading a persuasive text or even a newspaper article: Did the author make them feel a particular way about the topic in the text? How? Did their view change as they read more about it? Does the text remind them of anything they have read before? How is it similar or different? *Children working well below the level of the test are not expected to sit it, and are assessed by their teacher. Supporting your child to develop their reading comprehension skills. About KS1 and KS2 SATs. 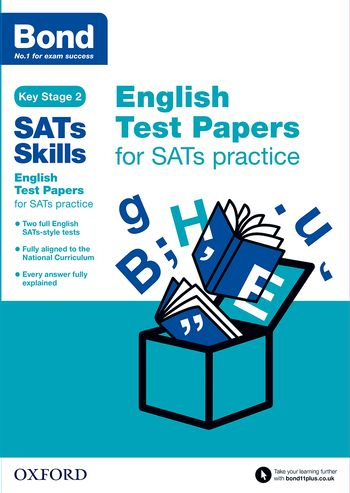 Two full sets of Key Stage 2 SATs-style English test papers to enable children to practise for National Curriculum SATs assessments. 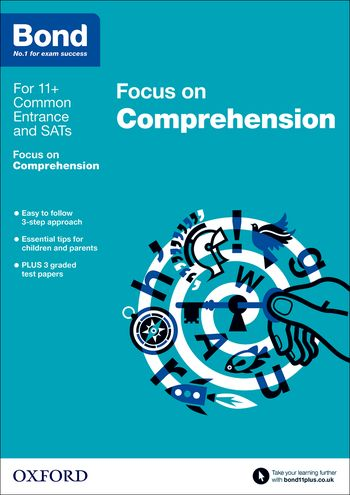 These tests develop children’s exam skills of time management and performing in exam conditions, and provide invaluable insight into the approach to testing that children will face when taking their SATs at the end of Year 6. 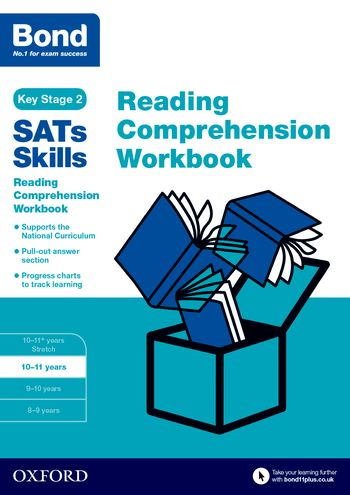 Bond SATs Skills Reading Comprehension Workbook for Age 10-11 has been developed by Bond to develop the core reading comprehension skills and knowledge required by the National Curriculum for SATs success. 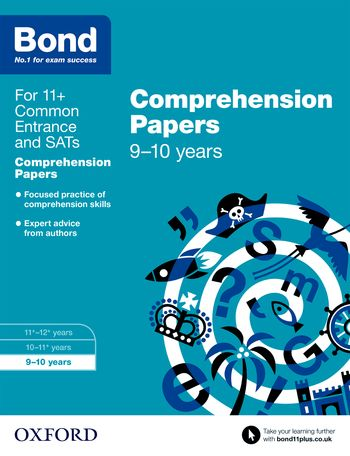 Bond Comprehension Papers are essential for building comprehension skills in preparation for the 11+, Common Entrance examinations and SATs.